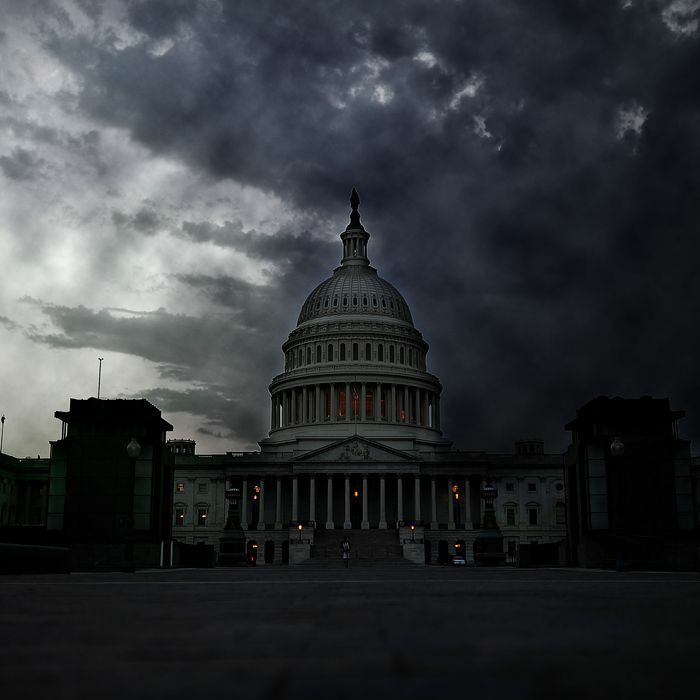 Even if you’re just tuning in to this fall’s fiscal theatrics, you might have heard that there are two bad things that could happen very soon: a government shutdown, and a breach of the government’s debt ceiling. A government shutdown sounds worse, in the sense that “shutdown” is a scary word and shutting down an entire government seems drastic. But make no mistake: a debt-ceiling breach would be much, much more painful. Economists and policy experts agree that reaching the “X Date” – the date on which we run out of money to pay our bills in full and on time, estimated to be around the end of October under current conditions – could be the start of financial Armageddon. We’d have to start making really hard choices. On the X Date, the Treasury department (which pays the nation’s bills) would have a major problem. It would have no cash left, and not enough new tax revenue coming in to pay its bills in full. Hypothetically, its best option would be to “prioritize” payments – using the money it does have to pay for the things it deems really important (Medicaid and Medicare expenses, say) and letting the bills for less-important things go unpaid for the time being. The problem is that there aren’t really any less-important things included in the Treasury’s regular payment schedule. It’s all stuff like food stamps, Social Security, military pay, unemployment benefits, and federal worker salaries. So these choices would be really, really painful. And forget about funding it all – it’s estimated by the Bipartisan Policy Center than 32 percent of the government’s entire spending would have to be cut, in order to spend only the cash it has on hand. Treasury could also decide to pay an entire day’s payments at a time, once it’s collected enough tax revenue to fund the entire day. This would mean not having to make tough choices between programs, but it would also mean that every government program was on the same terrible, sinking ship – with no lifeboats, even for the neediest ones. We could default on our debt. The U.S. has never, ever missed a payment on a bond it issued. That’s why Treasury bonds have traditionally been considered risk-free – you know you’re getting your money back. But under a debt-ceiling breach scenario, Treasury might have to delay or even miss payments to bondholders, putting Treasury bonds into technical default. Between October 18th and November 15th, more than $370 billion in U.S. government bonds are going to mature. Usually, when this happens, the Treasury department simply “rolls over” the debt – it issues new bonds, and uses the proceeds to pay the old bondholders their principal plus interest. But rolling over debt in a post-X-Date scenario gets tricky, since new bondholders might demand much higher interest rates, or, if not enough people wanted to buy the new bonds, Treasury might have to start paying back the old bondholders out of pocket. It might even have to default on the bonds. We don’t really know what happens if Treasury bonds default, since it’s never happened. What we do know is that it would destroy the market as we know it. Banks could go under, credit markets could seize up, money-market funds could “break the buck” (meaning that the net present value of their assets would be less than 100 percent of what their investors put in), and ratings agencies like Standard & Poor’s would almost certainly downgrade the U.S.’s credit rating, leading even more capital to leave the country. There is no good default scenario, only lots of really terrible ones. Investors might run away from Treasury bonds. If bondholders get scared of a default or a restructuring, they’ll start selling their Treasury bonds. The government will raise interest rates on new bonds to make them more attractive to buyers, which will then cause rates on all kinds of credit to rise. Car loans and mortgages will cost more, and we could see the kind of credit freeze we saw after the financial collapse. Or, they could run toward Treasury bonds, which might be worse, actually. The central nervous system of the banking system might freeze. Fedwire is one of the least-known, most important services on Earth. It’s a clearing system, run by the Federal Reserve, that banks in America use to shuttle cash, stocks, bonds, and other assets back and forth between themselves. It processes trillions of dollars a day, and has been around for nearly 100 years. But it’s not set up to allow defaulted Treasury bonds to flow through its system. According to a note from RBC Capital, excerpted by FT Alphaville, if the U.S. defaults on its bonds, Fedwire could “seize” entirely, meaning that banks and other financial institutions could run into real trouble very quickly. The borrowing window might get jammed. The Fed also can’t accept defaulted Treasury bonds at its borrowing window, even if those bonds are still trading normally. Usually, how the borrowing window works is: banks or other financial institutions that need short-term funding bring the Fed some Treasury bonds or other very safe securities, and the Fed gives them a low-interest loan, using the safe securities as collateral. But if banks can’t pledge Treasury bonds as collateral, it’s going to be harder for them to qualify for borrowing, and harder to fend off disaster if it occurs. The repo market might be squashed. Every day, lots of Treasury bonds change hands through a short-term financing process known as a repurchase agreement, or repo. In the most traditional form of repo transaction, a seller will sell a Treasury bond to a buyer, while promising to buy it back in the future at a certain price. Repo transactions are found in almost every corner of the financial world, and in some ways, they’re the glue that makes the markets stick together. And in a post-X-Date world, they get a lot harder. Just as they can’t be used at the Fed’s discount window, defaulted Treasury bonds generally can’t be used as collateral in repo transactions. Without repo, banks and other financial institutions will be unable to fund themselves in the normal way, interbank lending costs will skyrocket, and a workaround will have to be arranged in order to keep the financial system functioning normally. The bottom line: A debt-ceiling breach would be very, very, very bad. Keep in mind that these are all hypothetical scenarios. Reality could be better, or much worse. The truth is that while we sort of know what a government shutdown would look like (since it’s happened in the past), we have no idea what chaos a debt-ceiling breach could bring. If, in a month, we reach the X Date, run out of money, and are stuck in political stalemate, we’ll be entering truly uncharted waters. And we’ll be dealing our already-fragile economy what could amount to a knockout blow. What Happens If The Debt Ceiling Is Breached?